If you’re looking for solar panel cleaning MKR - Cleaning Services have the solution. We offer a professional and reliable service using the water fed pole method of cleaning, which means we can normally clean them from ground level. Solar panel manufacturers recommend that your solar panels are cleaned on a regular basis, usually annually. The problem with cleaning them yourself is that this can be a dangerous job without the correct equipment. Climbing up ladders to clean them is not a very safe method of cleaning the panels. 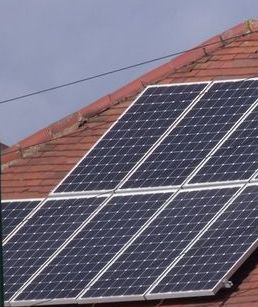 Having your solar panels cleaned will remove any debris that naturally builds up over time, potentially increasing the amount of sunlight that enters the panels and thereby increasing the amount of energy that is created. Start saving some money today with our solar panel cleaning service.